So what’s a perfect way to end a day at Macworld? Running into Frank Chu, of course. Who’s Frank Chu you ask? He’s a San Francisco icon and legend. Wikipedia is a good place to start. SFGate even published a Frank Chu FAQ earlier last year. 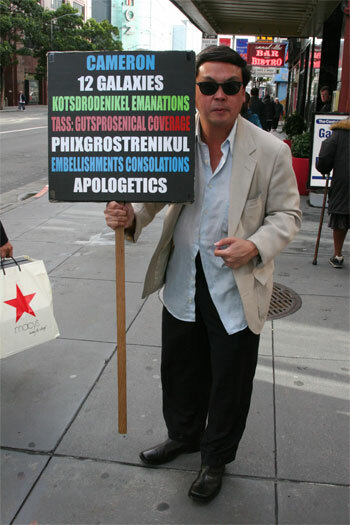 The best way to find out what Frank Chu is all about is to ask him directly when you see him on the street. Here are some more Frank Chu sightings. Frank opened our Laughing Squid 8 ½ Year Anniversary Show back in 2004 at 12 Galaxies, a venue who’s name is tribute to Frank Chu.